Executive Summary: Contractors usually are mandated to attend a pre-construction meeting with the Owner. There’s no reason not to also have an internal pre-construction meeting. My story. We always talked a good game, but never did these meetings on a regular basis. It was a mistake. Primarily because it didn’t allow corporate and other people in our company to be in the know and coordinate. 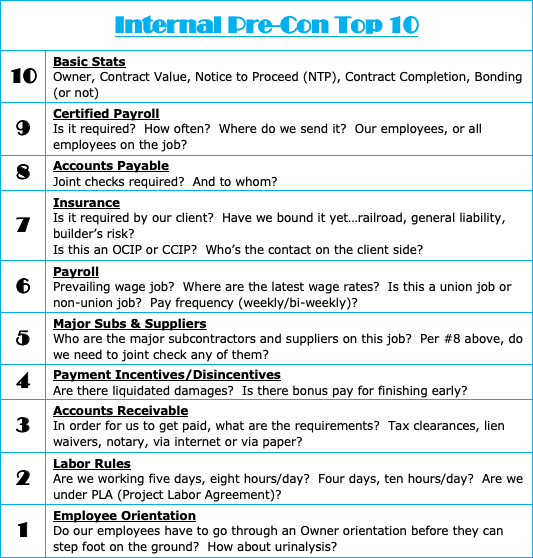 Communication is key to a successful project which can be done easily via an internal pre-con meeting. Do them!